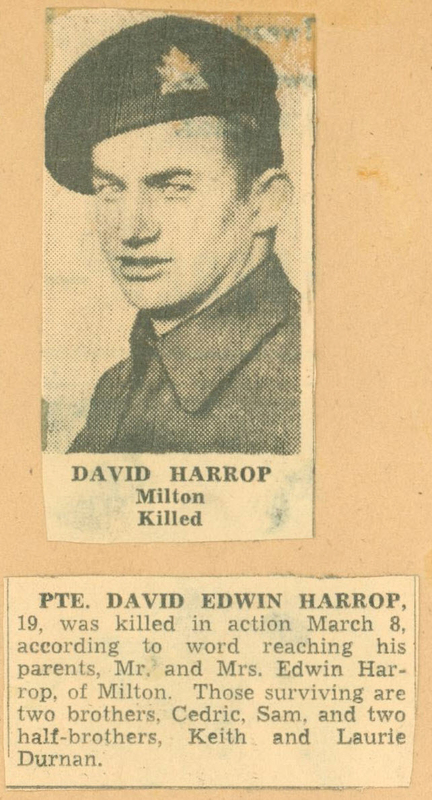 Reflections of past times in Milton during WWII as illustrated by the news of the war are revealed in the newspaper clippings from the Toronto and Milton papers. 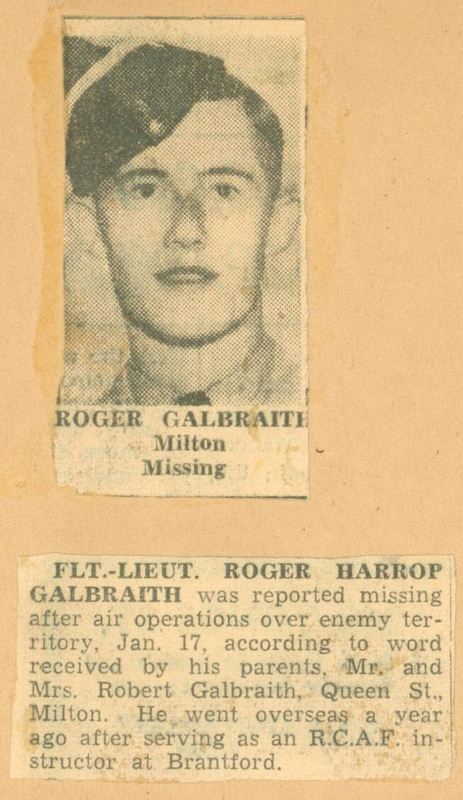 Links from the list of Milton’s WWII casualties takes you to the Canadian Virtual War Memorial where we have posted all of the Milton Archive news clippings in the files of those men that paid the ultimate sacrifice. 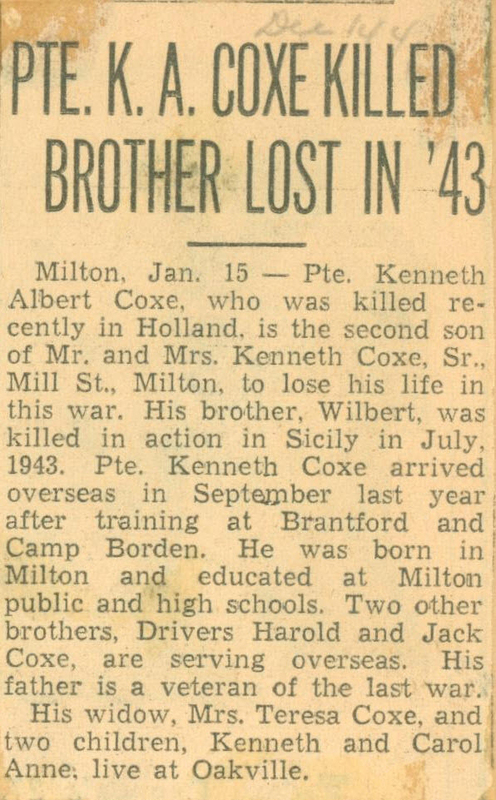 Those shown here in text format were extracted by the MHS Archivist from the Milton Champion microfilm, which is available at the Archives at 16 James Street, Milton (Waldie Blacksmith Shoppe). Click on any of the clippings to see them in larger scale or see them first hand at the Archives. The text based newspaper reports are shown in chronological order, followed by the scanned images copied from the MHS Archives. Another Milton Young Man Has Paid the Supreme Sacrifice. 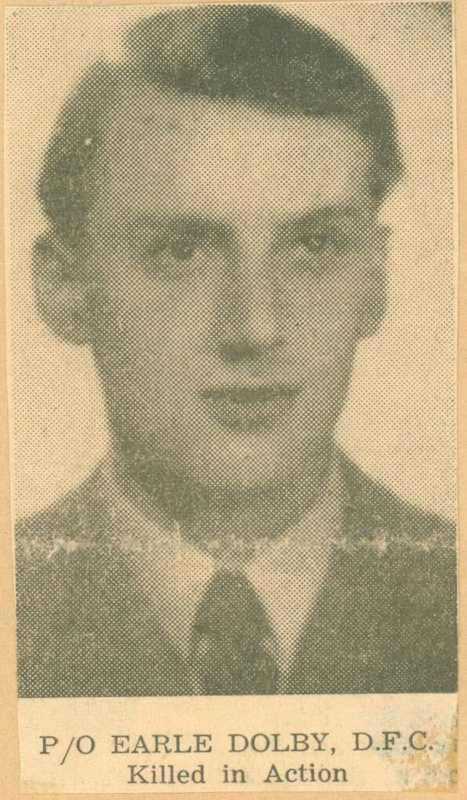 The tragic news of war’s casualties has come to another Milton home with the word that Flying Officer Frances (Frank) Charles Bowring had been killed in action in Italy on Thursday May 11th. Burial took place at 5.30 p.m. on May 12 at San Sevetor, Italy. Frank was 23 years old. 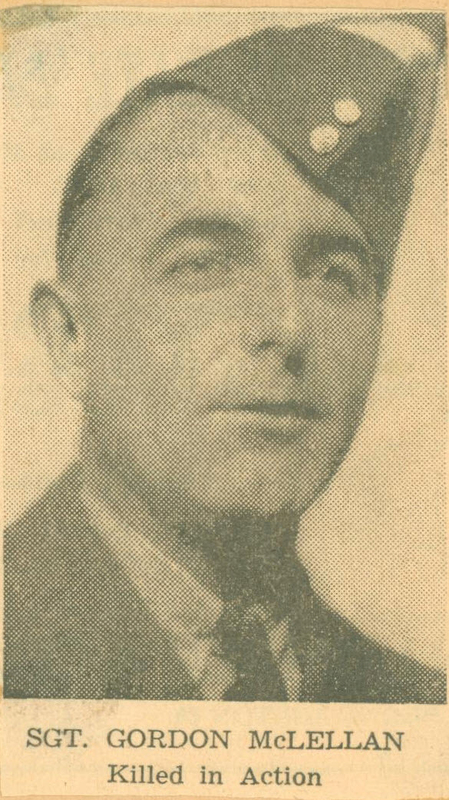 Born in Milton, Flying Officer Bowring was a son of Mr. and Mrs. Charles Bowring. He leaves his wife, parents and three sisters Mrs. D. H. Timbers R.C.A.F (W.D.) of Montreal, Kathleen and Marjorie at home. Townsfolk and friends extend deepest sympathy on this tragic news. Francis Bowring was born in Milton, educated in Milton Public High Schools, played hockey for several years with the junior team that was in the finals in 1939 and the semi-finals of 1940. 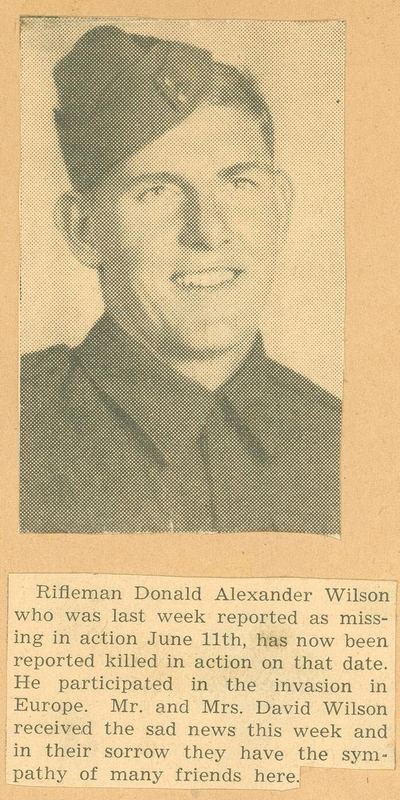 Before enlisting, he was employed at the P. L. Robertson Mfg. Co. here. 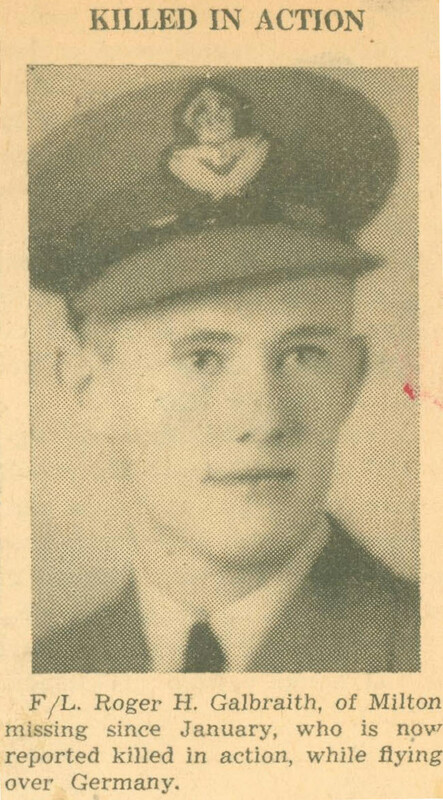 He enlisted at Toronto in September, 1941, trained at Belleville and St. Eugene and received his wings at Uplands. This was followed by a course in reconnaissance work at Summerside, P.E.I. In March of last year he went overseas. 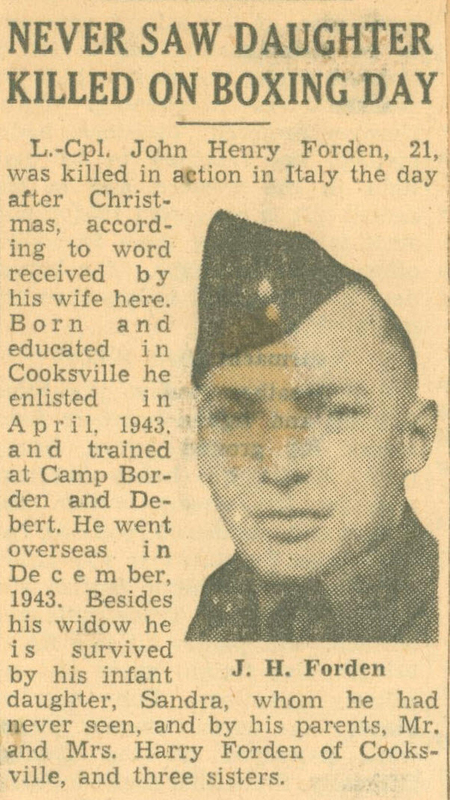 He served in England, Africa, Sicily and Italy. 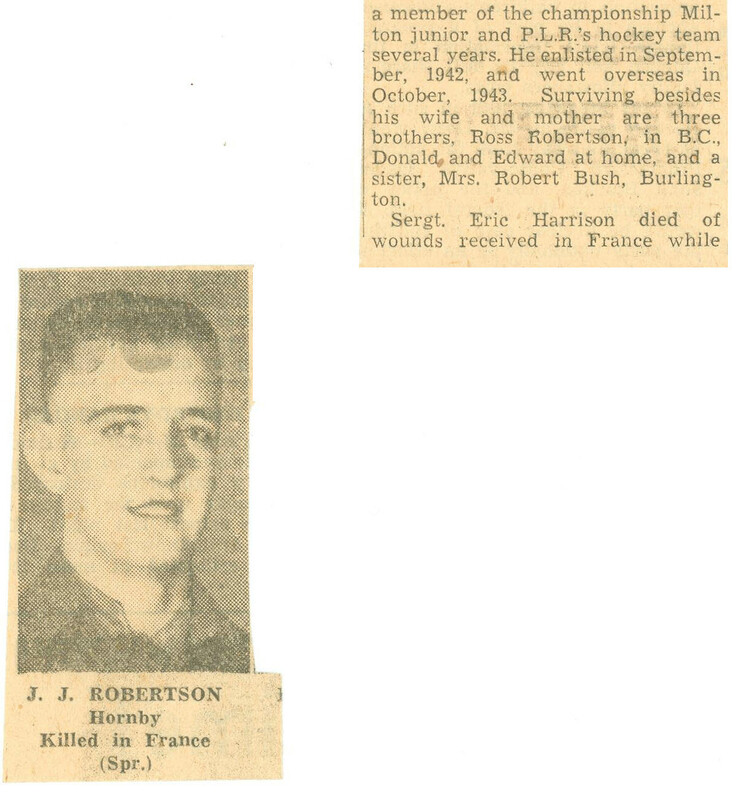 Parents Received Word He had Been Killed in Action on July 9th. 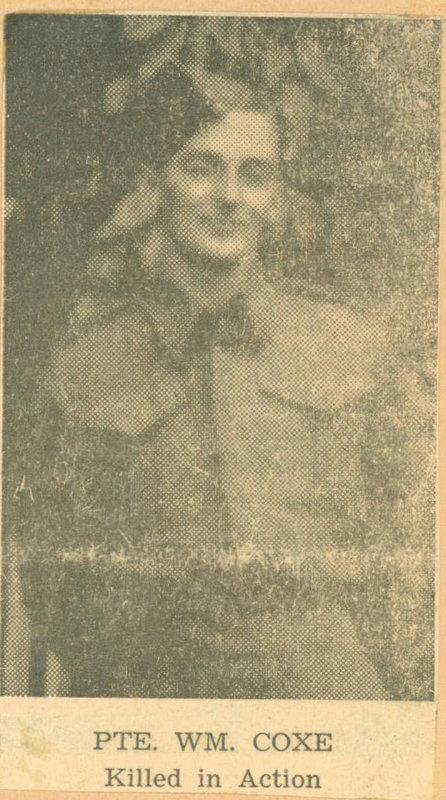 The grim reality of war came to another Milton home this week, when Mr. and Mrs. Frank Morley received word that their son, Pte. 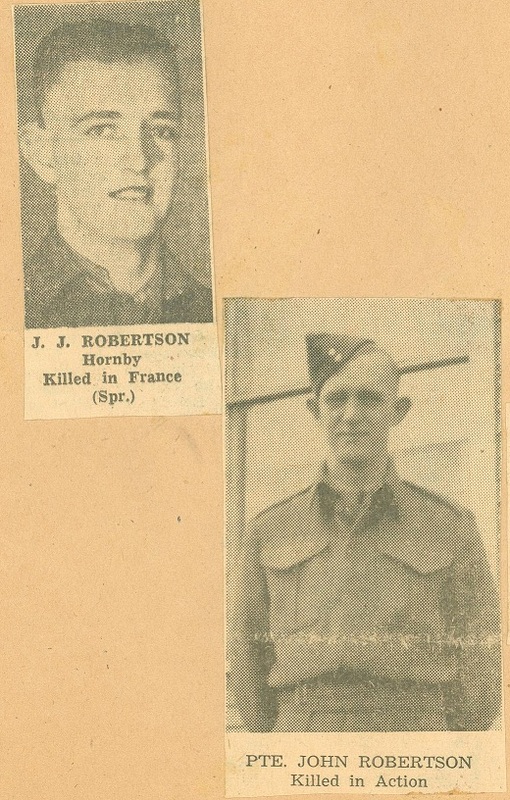 George Edward Morley had been killed in Action in France on July 9th. Pte. Morley was nineteen years old and was born in Milton. He attended Milton Public School and before enlisting was employed at the Spinning Mills here. He joined the Army in February l943, and received training at Simcoe, Camp Borden, Prince Rupert and Vancouver, before going overseas in May this year. He was stationed in England until the invasion. Another brother, Jim, is serving his country in Italy and was wounded in action there a short time ago. Four other brothers, Allan, Bob, Harvey and Frank and a sister Bernice (Mrs. Grant Baker) all reside in Milton and a sister Mary lives in Toronto. Many friends here will join in heartfelt sympathy with the parents and family in the loss they have sustained. Son of Mr. George Collis, Milton Was Holder of Efficiency. Another was casualty has come to a Milton family this week. Sgt. 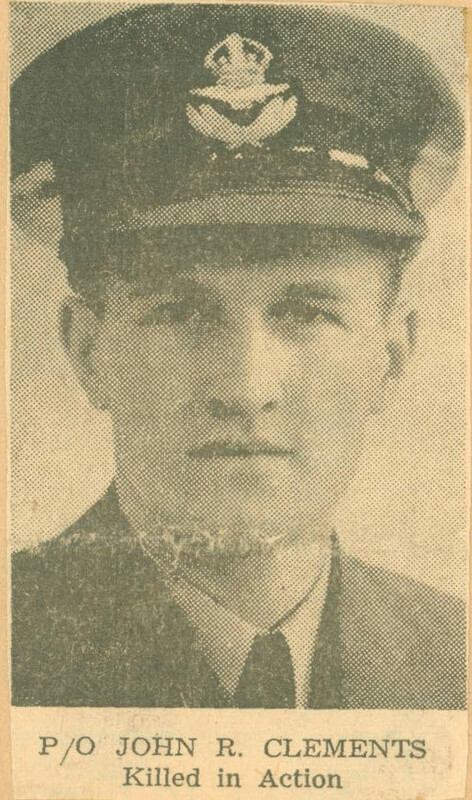 John A. Collis has been reported killed in action. He was twenty-eight years of age. Born in Lowville, he attended school in Milton. 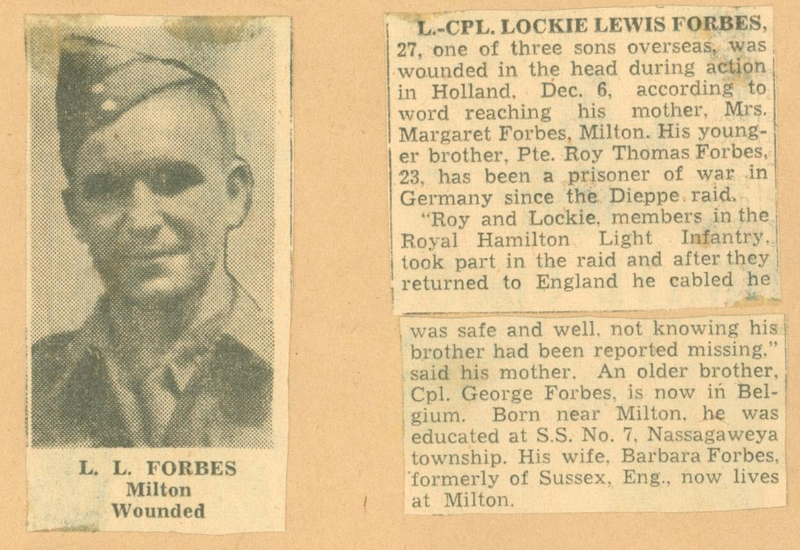 He is a son of Mr. George Collis, Milton. Always interested in the army and an army career, Sgt. 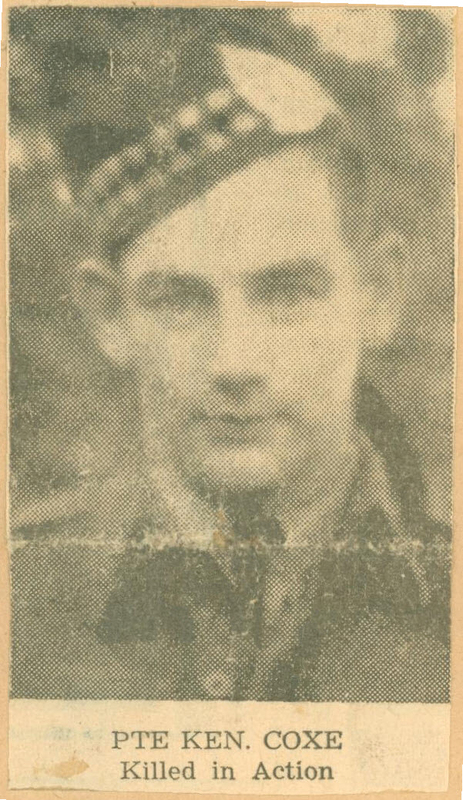 Collis was a member of the Lorne Scots before the outbreak of war with the Irish Regiment of Hamilton. 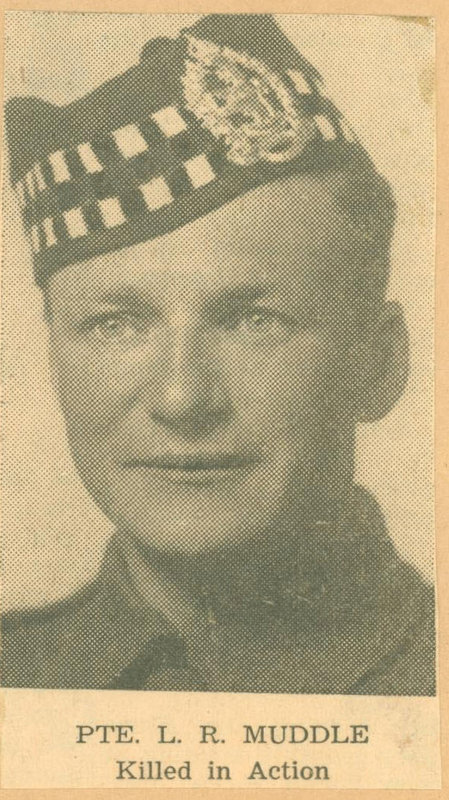 He trained at Megantic, Quebec and transferred to the paratroopers and trained at Shilo, Manitoba. For some time he was sent across Canada to training camps, serving as an instructor and organizing Junior Training Schools. He was awarded the Canadian Efficiency Medal and in May of this year was further honored by being awarded the first clasp to the medal. He was keenly interested in the army and aimed to make it his life work. He was also interested in boxing and wrestling. Besides his wife and son who reside at Bradford and his father, Mr. Geo. Collis, Milton, he leaves two brothers, George in Hamilton and Cpl. Leslie Collis in England and a sister Mrs. Nolan (Irene) of Hamilton. Many friends here extend heartfelt sympathy to the father and family at this time. Had been in France since D-Day just out of Hospital. Mrs. Laurette Auger of Brampton received word of her beloved husband, Rfm. 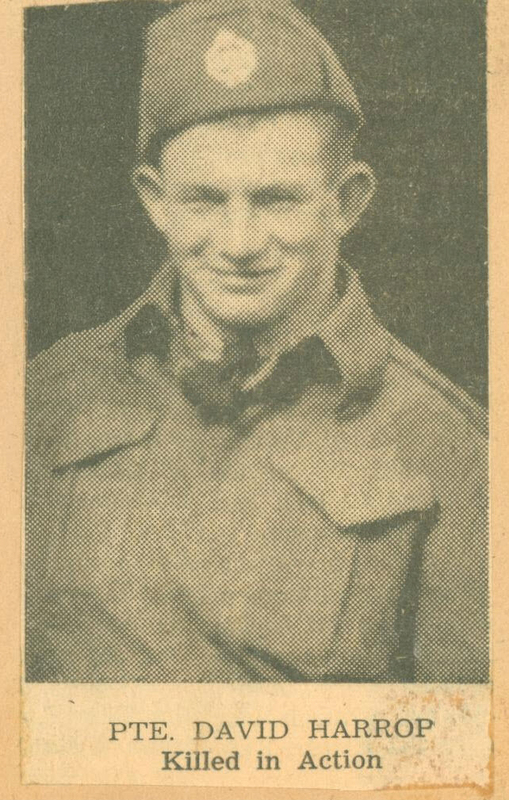 Arthur George Auger, who has been overseas four months going to France on D-Day and wounded on July 18. He had been out of hospital just a few weeks when word of his death was received. He went overseas with a Reinforcement Unit and was later transferred to the Queen’s Own Rifles. 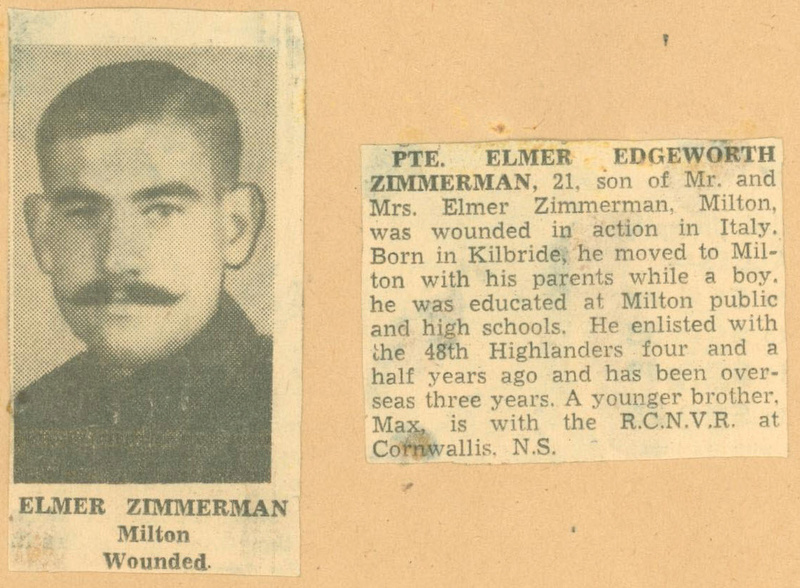 He was the eldest son of Mr. and Mrs. Arthur Auger of Milton. Rfm. Auger was born in Milton thirty-one years ago and was educated in Milton Public and High Schools and a member of Grace Church, Milton. He married the former Laurette Wilson eleven years ago. Left to mourn are his wife, mother, father and two brothers. 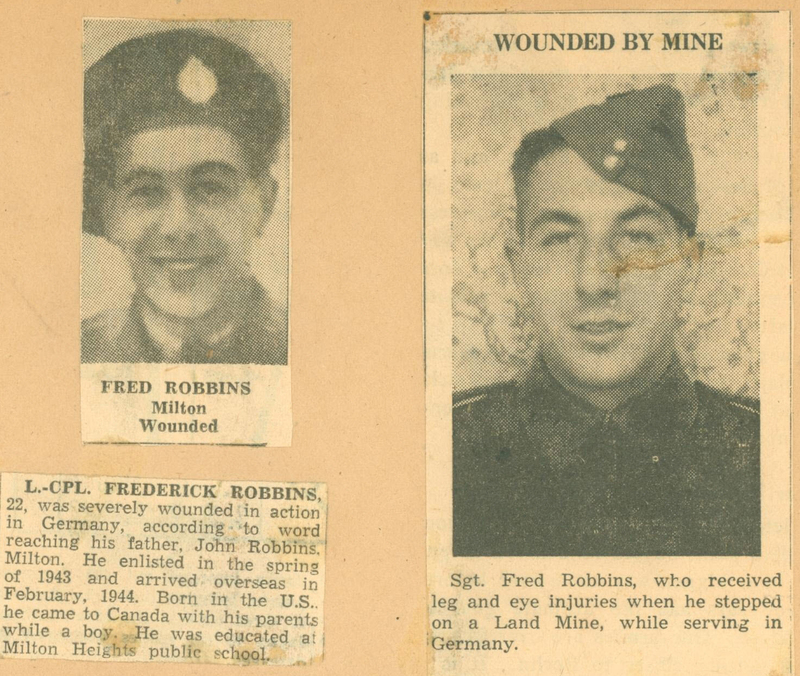 Charlie now serving in France and Harry in the 21st Canadian General Hospital in England. Proceed to the WWII Soldier Details, WWII Soldier Extracts, or back to the Second World War page.